Jolly Jomo at Clarke Quay Singapore saying hi to everyone! Clarke Quay is a historical quay in Singapore situated along Singapore river and Boat Quay. 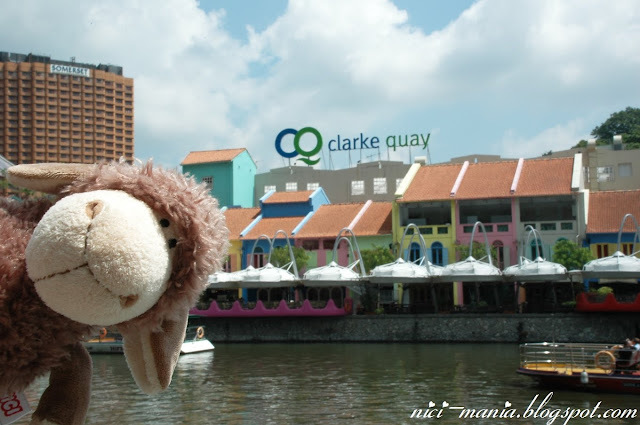 Clarke Quay was named after Sir Andrew Clarke, Singapore's second Governor and Governor of Straits Settlement. 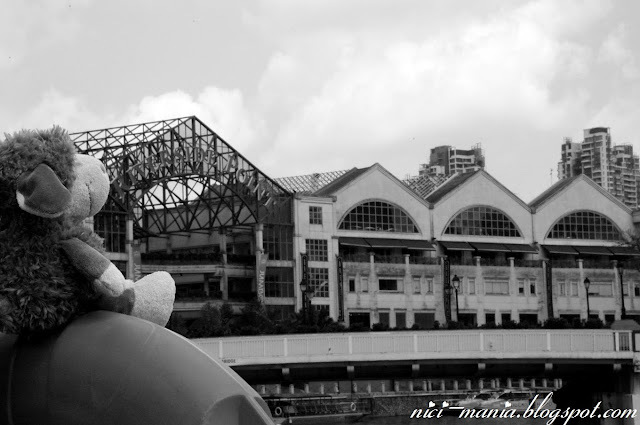 NICI-Mania recently decided to undertake a brand new project bringing you images of Singapore. 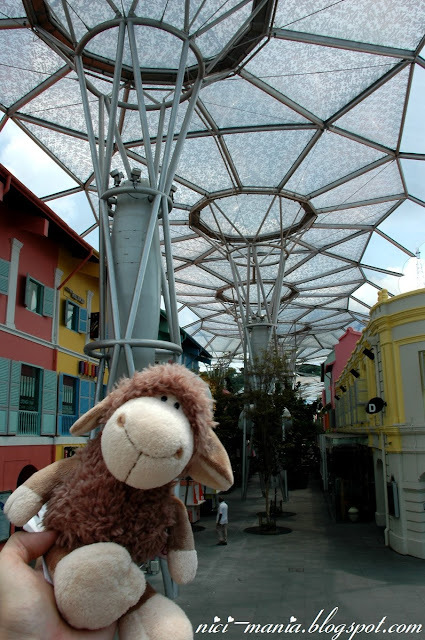 Clarke Quay is our first stop and Jolly Jomo is the lucky brown nici sheep to be the first sheep from our flock for this project. One of the most popular leisure at Clarke Quay is taking a river cruise with a river taxi. What baffles us is that business seemed to be quite good at any time, there are many tourist enjoying the river cruise even when the sun is burning as hot as now. Jolly Jomo with G-Max reverse bungy and GX-5 extreme swing behind. Jolly Jomo will make one big round around Clarke Quay to reach the other side of the Singapore river later. Another river taxi with tourist passes by as Jolly Jomo looks upon them. 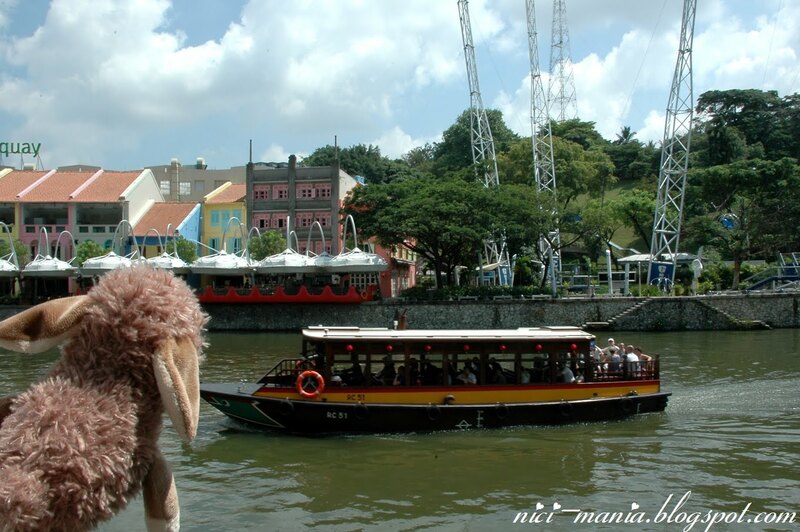 River cruising along Clarke Quay Singapore is considered a boring activity among local people, I guess that goes the same for the locals in Europe for the Danube river cruise and Rhine river cruise. The only difference is, its much crazier to take the Clarke Quay river cruise as it is 91 degrees Fahrenheit in Singapore compared to 15 degree Celsius when we were river cruising Danube river in Budapest during spring. 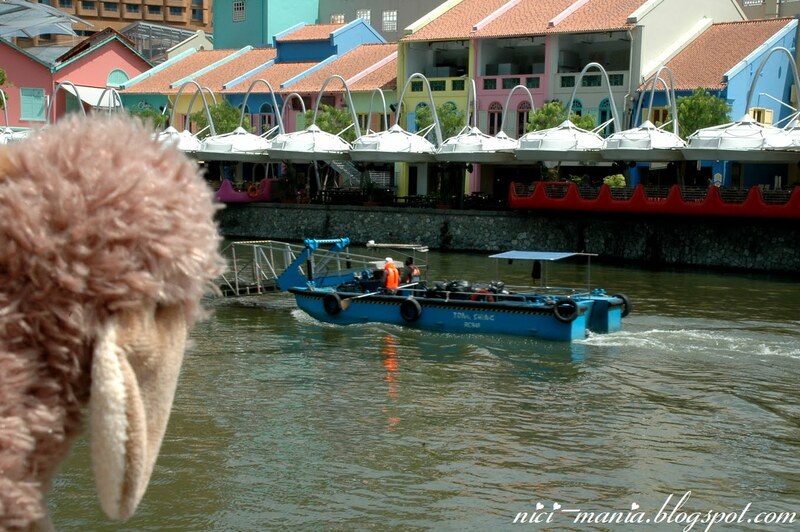 Jolly Jomo pondering at what seemingly looks like a boat cleaning the Clarke Quay Singapore river. The best time to take the river cruise should be around 6:30pm in the evening. 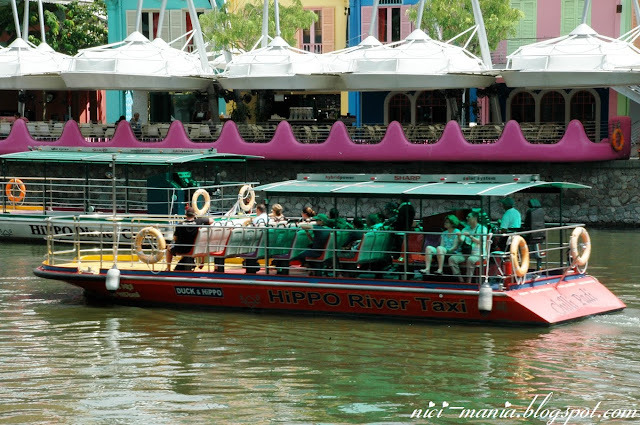 A single river taxi ride is $15 covering Boat Quay, Clarke Quay and Marina Bay for a total cruise time of 45mins. That was the only cruise we have taken before. 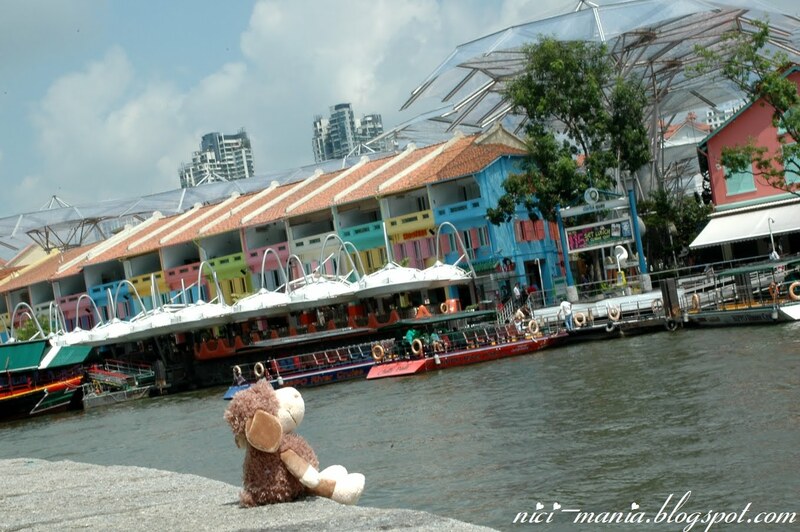 Jolly Jomo sitting on the edge enjoying the scenery of Clarke Quay Singapore. Below Jomo is about 10 steps of stairs right into the Singapore river, this was a precarious picture to take as Jolly Jomo would not want to fall into what used to be a dirty river before the pollution cleanup. 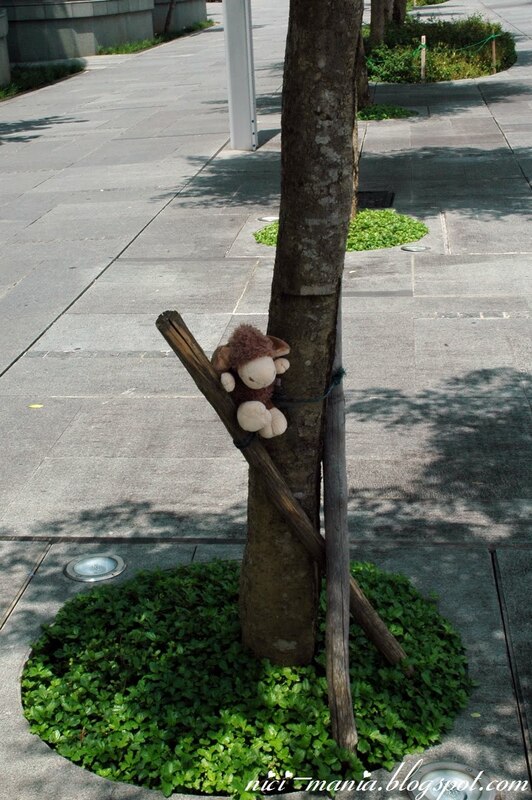 Hence, Jolly Jomo looked for other things to play with instead of sitting on the edge of Clarke Quay. Not really sure what he is trying to do here. 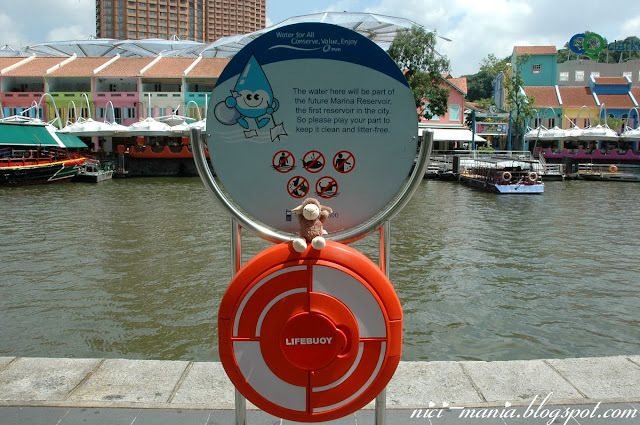 This sign at Clarke Quay Singapore says: The water here will be part of the future Marina Reservoir, the first reservoir in the city. So please play your part to keep it clean and litter free. 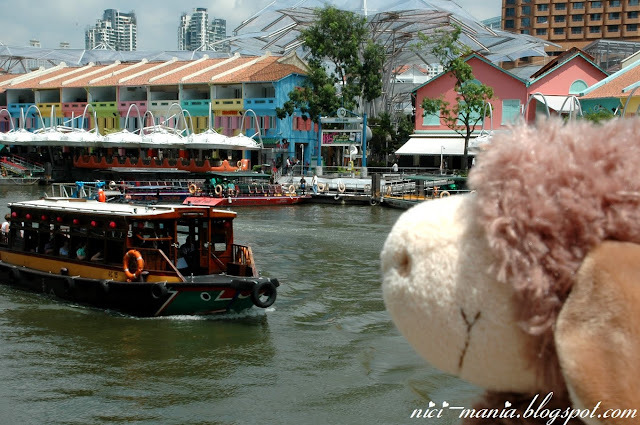 Jolly Jomo spots a Bumble Bee boat cruising along Clarke Quay Singapore river. The boat is very cute but why are there only like 3 passengers? 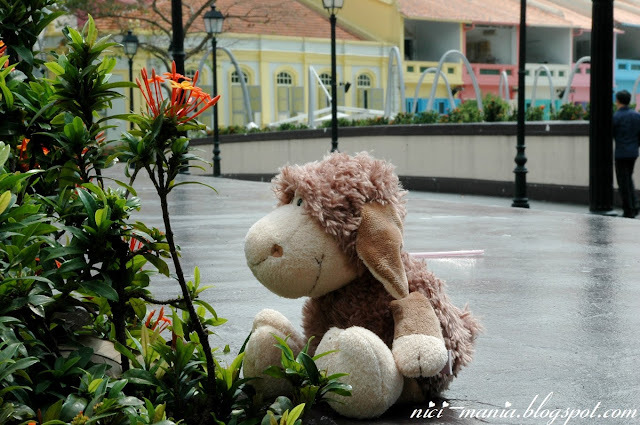 Our brown nici sheep enjoying the greenery at Clarke Quay. Other sheep in our flock are jealous! Jolly Jomo black and white shot at clarke quay. The colorful buildings along Clarke Quay Singapore river is quite an amazing sight. Clarke Quay used to be the main trading port in Singapore and these restored shop-houses are now converted to many bars and restaurants extremely popular among Singapore tourist. 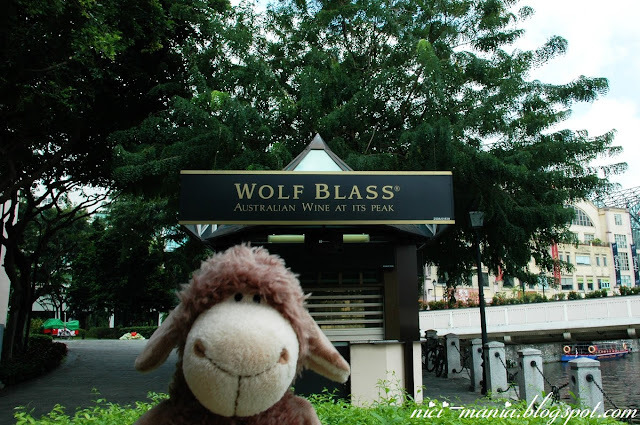 Jolly Jomo is standing in front of a alcohol bar which says Wolf Blass Australian wine at its peak. As far as I remember, they aren't selling Wolf Blass Australian wines, just beer and some other stuff. Jolly Jomo started today's journey from Central Mall, now approaching the first bridge at Clarke Quay over Singapore river. Jomo tries another dangerous stunt again sitting near the edge of Singapore river behind. 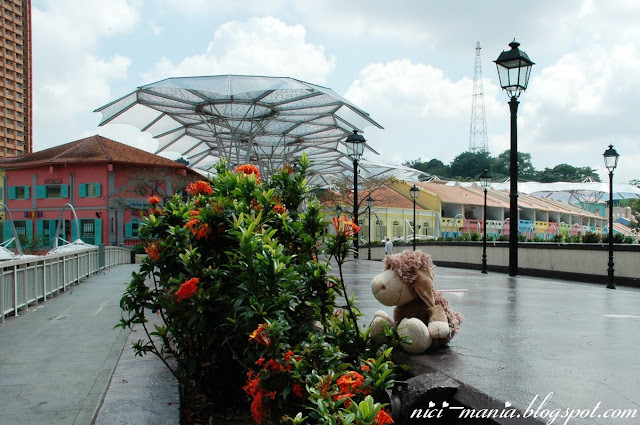 Jolly Jomo decided to cross this bridge to the other side of Clarke Quay Singapore river..
but stops for a little time with these flowers. We used to imbibe the sap of these red flowers when we were young, it was a very fun and popular thing. The sap is sweet and one twig of red flower only has one tiny drop. 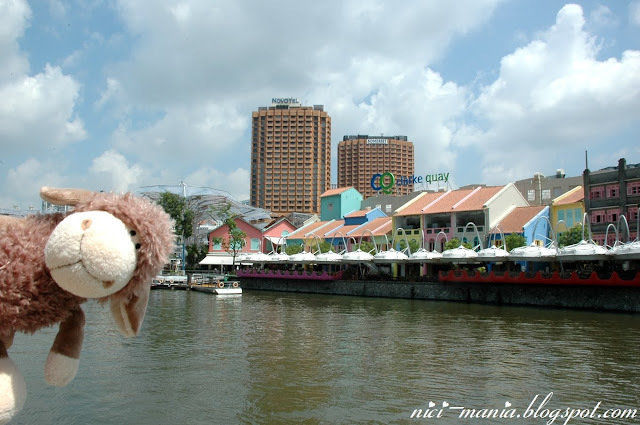 Behind Jolly Jomo is the further end of Clarke Quay which we didn't walk towards but crossed the bridge instead. 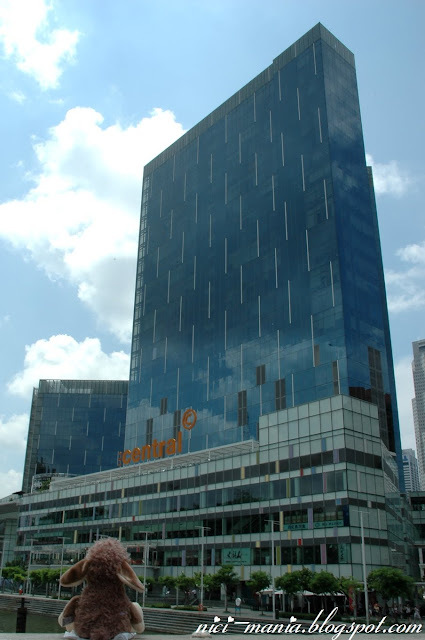 The metal framey looking building has a sign saying Riverside Point. 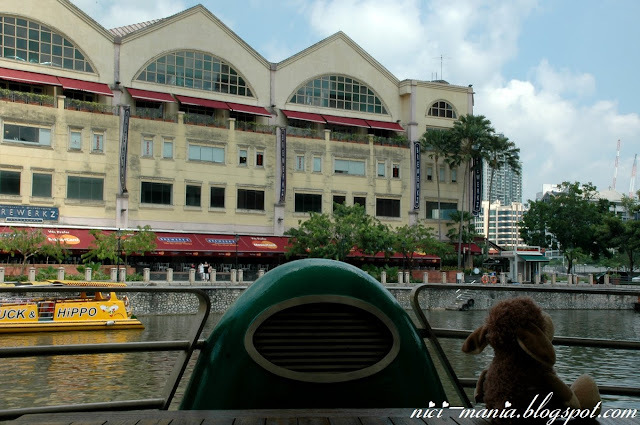 Riverside Point is a waterfront dining venue with restaurants such as Brewerkz, Jumbo Seafood Restaurant and Café Iguana. 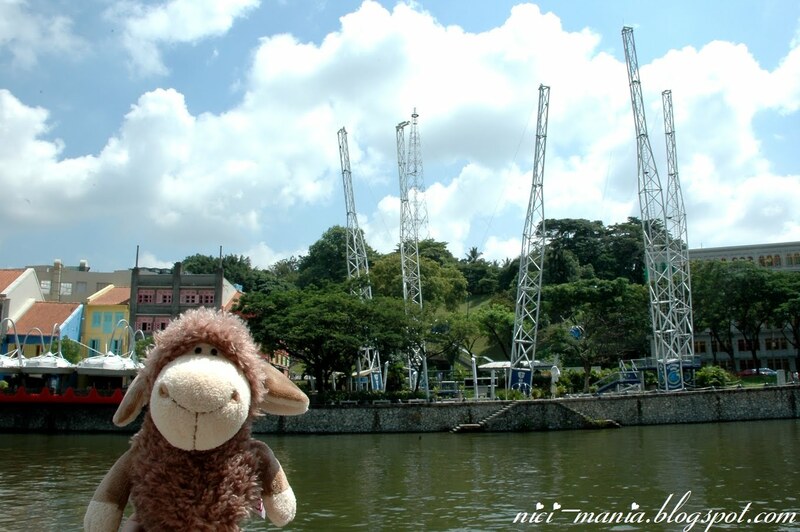 You can take a lift up the building and have a slightly panoramic view of Clarke Quay Singapore river. 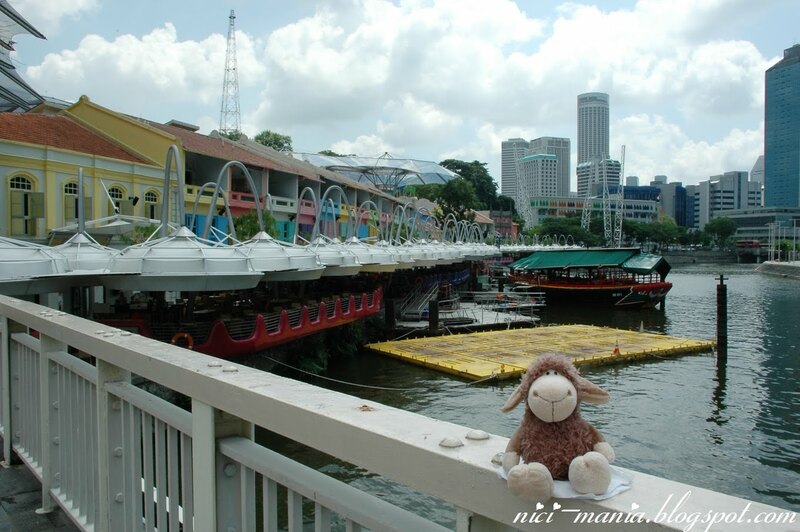 Jomo gradually crosses the bridge to the other side of Clarke Quay and sat on the railings back towards the direction where we came from. 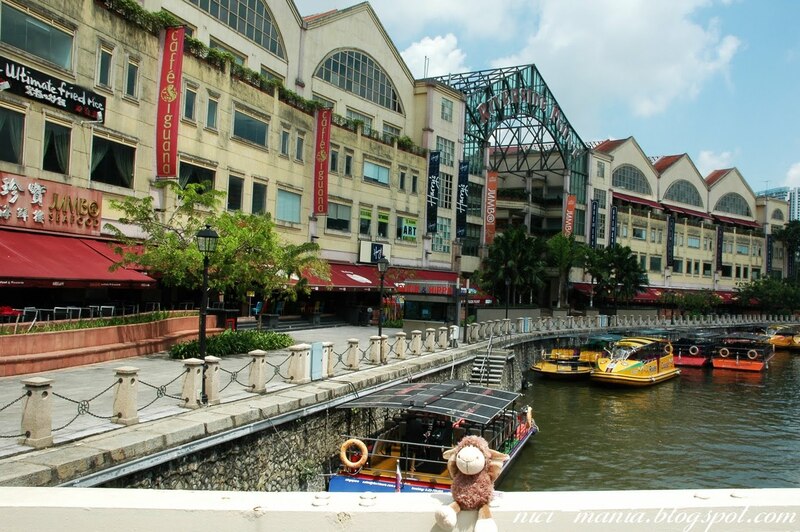 Jolly Jomo then looks upon Central Clarke Quay, the place that host Santouka Ramen, best ramen in Singapore. You can check out our Santouka Ramen review here. 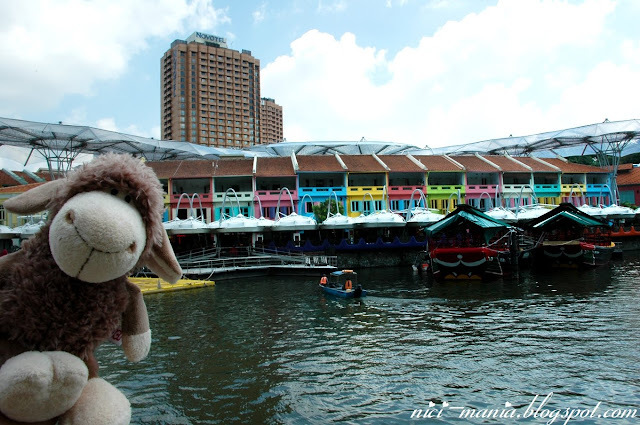 Jolly Jomo successfully crossed the bridge to the other side of Clarke Quay where all the colorful shop-houses we saw earlier are. 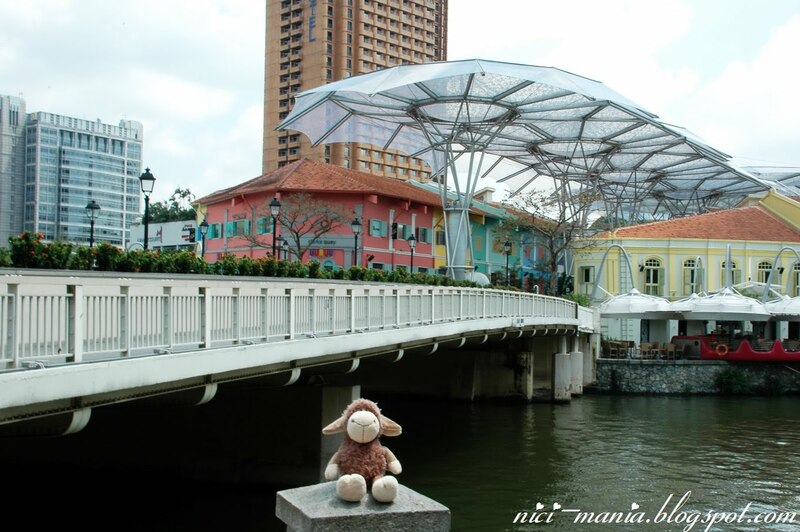 Stay tuned for the next edition of Jolly Jomo at Clarke Quay Singapore as we bring you more pictures. Does this image look like Jomo is sitting on a boat cruising along Singapore river? Opposite us is Brewerks Singapore, a microbrewery beer + food restaurant. We will pay a visit some day, see you in Part II soon! Hello Jomo! You are a very cute sheep and we love your wonderful photos :-) Must be gorgeous to have a boat trip with such a beautiful surrounding! 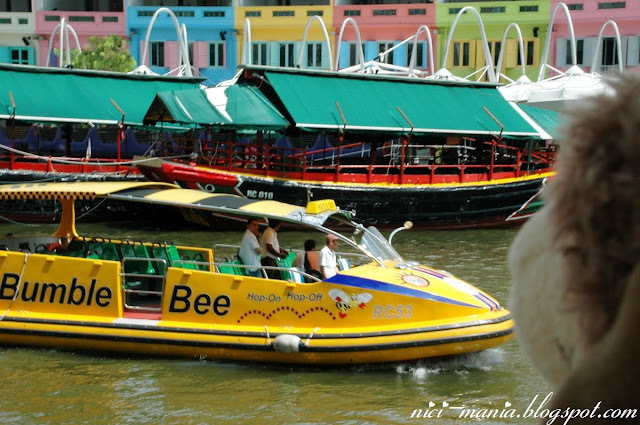 The bumble bee is very funny and our flock would chose this boat! The colourful houses are so lovely. 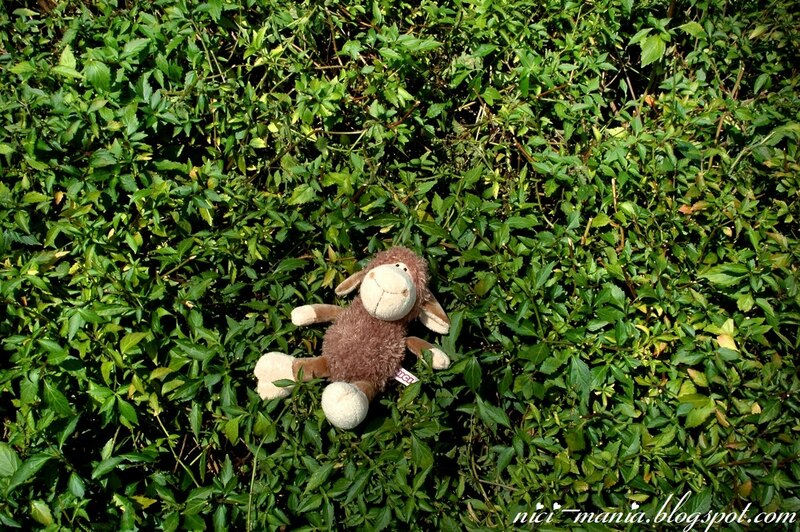 We enjoyed your post, many thanks! How great the enthusiasm is of you jolly brown, he's a very cute sheep, always happy to be in a picture and travel and see a new spot. You must be happy to have taken him along! Could it be that you have visited some of these places before? Some pictures seem so familiar. @Raquel: Thank you Raquel, there are much more to come! We love your wonderful pictures of Spain too! !